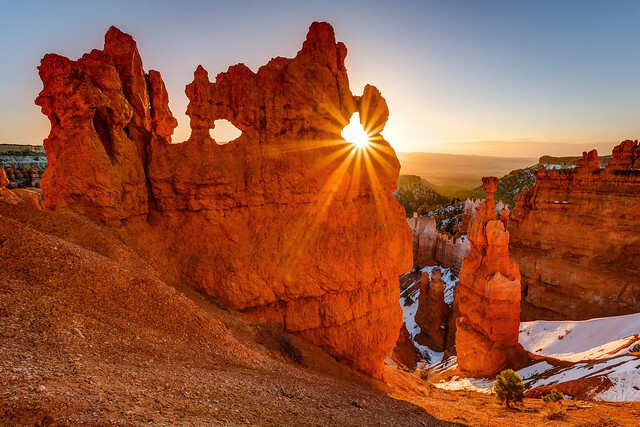 What a killer shot of Bryce Canyon. There’s only two ways to get a shot like this, you are wandering by and just happen to time it exactly right, sit down and take the shot; or you had to plan it and make certain you where there at the exact right time. I’m willing to bet this one wasn’t from the lucky side, but the plan it out side. This image is so fantastic, it shows the crazy colors that dusk brings out in a place like Bryce. It shows you the bright orange and reds, highlighted by the fading sunlight. Truly a marvelous image. The other thing I like about images like this is that it gives people extra incentive to actually hike in Bryce. Often people come for a day, or a half day, drive around the various look-off points, take some pictures and call it good. When in reality to really experience this place you need to get out of your car and get your shoes a little dusty. If you do you’ll find a whole other side of Bryce that is steeming with wonder as you make your way down the trails.